Yiddish, the language of European Jewry, is based in German with elements of Hebrew as well as Aramaic, Slavic, and Romance languages. Though it reached its height as a language before World War II, it is experiencing a renaissance today. American English is peppered with common Yiddishism such as deli, shmooze, glitch, maven and shmuck. 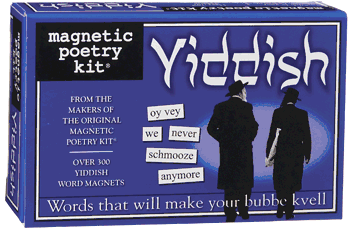 This kit contains a mix of Yiddish and English words and comes with a mini Yiddish dictionary, allowing everybody to join in the fridge door kibitz!